Children with cleft lip or an open palate have problems on different levels: eating does not go well, which causes them to be underweight. Frequently they have dental problems which make it harder to speak. 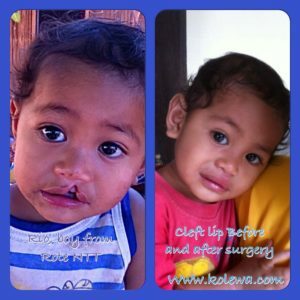 A (relatively) easy surgery can give these children the chance to have a healthy and independent life! 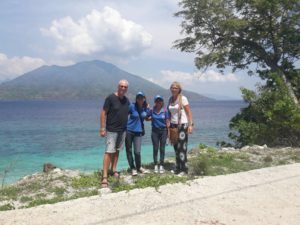 We scout potential child patients as well as young-adults and transport them (and their guiding family member) to Bali for surgery and further treatment. During treatment, the children and their guardian stay temporary in our shelter Rumah Bicara. The medical staff of the Dharma Yadnya Hospital focuses on the surgery and hospitalisation. 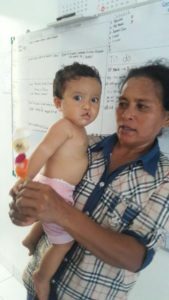 At this moment the procedures are financially supported by the Rotary Club Nusa Dua and Kolewa takes care of the costs for transport and shelter. Surgery is made possible for approximately USD 585,-. You can ‘adopt’ one of our children on the waiting list for surgery. We will keep you informed about the progress. A one-time contribution is always welcome. Alor, our first mission is done!